The best friend to hair and nails, now in a convenient capsule form. Biotin is a water-soluble vitamin necessary for normal growth and body function. Biotin is a key regulatory element in gluconeogenesis, fatty acid synthesis, and in the metabolism of some amino acids. Alongside its role in energy production, Biotin enhances the synthesis of certain proteins. 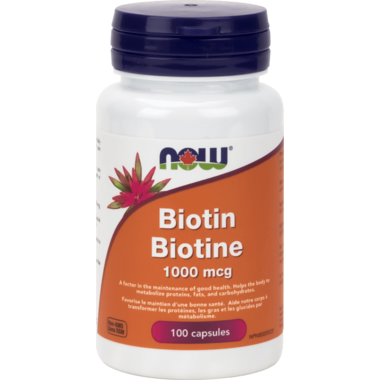 In addition, Biotin promotes normal immune function and plays a critical role in hair, skin and nail health. Mid level potency. Suggested Usage: As a dietary supplement, take 1 capsule daily with a meal. I just started to eat this for my broken nails. And it helpes for my nails and hair. If you are on a diet, i high recommend to eat this! I have been taking this supplement for several months now and I notice my nails are stronger and aren't peeling anymore. I just started using this product for my dry, brittle hair and nails. Too soon to tell if it is helping, but Well.ca always provides excellent service and a wide variety of great products, so I am a big fan. I'm using this product because my hair has been thinning a lot lately. I haven't noticed a huge improvement yet, but it does seem to make my hair stronger. I also have a very fragile stomach and for some reason, this product seems to soothe my stomach as well, which is a benefit I did not expect. A good price for a good brand. I have taken biotin for years off and on and I do find it makes a difference in my hair and nail quality. Nice small capsule. Prefer this instead of the pill form. Great price for this quantity. These are an excellent size and quantity for bariatric patients. Great for hair and skin. Noticed a definite improvement in my very fine hair. Roots are denser and just overall feels healthier! The capsule is a nice small size, easy to swallow! I have been on Biotin alittle over a year and my hair is much healthier and seems to grow better not sure if its rapid or not because I still have alot at my age but the nails seem to grow very fast too bad they are just prone to breakage otherwise I will continue on Biotin till I die! so far my nails look stronger. it works! Biotin has made a huge difference in my hair and hair loss. With early menopause my hair was falling out, think and dull. Combining this product with a hemp shampoo made such a difference, little hair loss, hair is returning to a darker color with less gray and is coming in thicker. Would suggest it for all older women and men. I get cystic breakouts like crazy when I use this and when I stop taking this, it took about 2 weeks for my skin to clear. But for some reason, I can take 2x500mcg of Now Biotin with no breakout. I'll stick with the lower dose. Not sure what to expect here. No better or no worse. so I guess I'll have to wait it out as I haven't been taking it religiously either. I'm taking pretty low doses, not every day. I had read that biotin could cause acne, and I don't know if it's coincidental but I had a bit of a break out after I started taking this. But on the plus side my nails feel noticeably stronger. (I forgot to rate it the last time) I love this product! I have been going through some hair loss due to stress and the hair that was growing was very weak. This has helped speed my hair growth and my hair is a long stronger. As a bonus my nails are growing beautifully! Good price, appears to be a good product. Doesn't seem to have side-effects. I love this product! I have been going through some hair loss due to stress and the hair that was growing was very weak. This has helped speed my hair growth and my hair is a long stronger. As a bonus my nails are growing beautifully! Since I started taking this product, my nails break way less often. I'm pleased! Excellent product and priced fairly. I have used this product before but the price was very good and it arrived quickly! I love that well.ca is a Canadian company! I would recommend this to anyone! I think this product is fantastic! I've been recommending it, and Well.ca to friends like crazy! Very pleased! I love all NOW products. Biotin is great for hair growth and stonger nails. love it! I take it as an antioxidant and to prevent greys.dont really have any greys and my nails r long and I have lots of hair to begin with. another great product from NOW foods. my energy levels did increase while taking this product. i have better skin, hair, nails and energy. it is a small capsule also transparent, i did not have any digestion problem. the bottle is very compact i wish it would be bigger. I've been using this product for about 2 weeks now, I havn't noticed any significant hair growth yet but it's probably too soon to tell. I have noticed faster nail growth now though. So far so good. Works really well with hair growth and nails. My nails grow strong and steady now after about 2 months of taking Biotin and my hair grows like crazy. It hasn't thickened at all, which was what I was hoping for. Warning, hair will grow faster everywhere! I have to shave and wax much more often now. Great product. First time I have bought biotin in a capsule form and it's great. I love this biotin its great to grow healty hair. Its easy to swallow would buy again! I use Biotin to help my nails grow stronger and stop splitting. It takes about 2 months to really see the result (If you take one pill a day, every day). It works but it's not a "miracle" product. Instead of nail polish, it provides long term result. It's work the investment, to me at least! I love Biotin for hair growth. My hair does not grow and after 8 months of taking Biotin it has grown 6 inches in length. My hair dresser recommended it when the haircut she gave me was too short. I love long hair and have been trying to get it to grow for years. Biotin really worked for me. This is the second time I purchased this product. Works great!!! I am on medication that causes mild alopecia (hair loss/thinning). I was told to try 1000mcg Biotin and so I got these pills and have been having them for the last 10 weeks. I've definitely noticed a difference. My hair is as thick as it was 10-15 years ago, and there are almost no clumps in the shower drain anymore. I'm very happy I found out about Biotin; I was starting to get really depressed over losing my hair, which has always been one of the few features of my body that I find naturally beautiful. Now, I'm getting more of this supplement for myself and my partner. I've been using this for weeks. Hair loss is reduced. Reasonable price and fast shipping. I have been using biotin for a few weeks now and I can already tell the difference in strength and length. Great product, reasonably price.